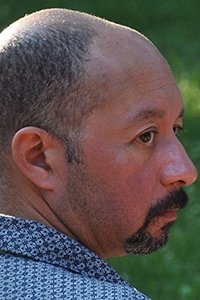 Award-winning poet Carl Phillips will give a free, public reading on Monday, March 23, at 6:30 p.m. in the Jones Room of the Woodruff Library at Emory University. A reception and book signing will follow. His awards and honors include the Kingsley Tufts Poetry Award, the Kenyon Review Award for Literary Achievement, the Lamda Literary Award, and fellowships from the Guggenheim Foundation, the American Academy of Poets, the American Academy of Arts at Letters, and the Library of Congress. Phillips’ 13th book of poetry, “Reconnaissance,” will be published in the fall of 2015. He is currently professor of English and African American studies at Washington University in St. Louis. During his Emory visit, Phillips will participate in a colloquium with students on March 24 at 2:30 p.m. in N301 Callaway Center. He will take questions from the students and talk about his life as a writer. This event is part of the 2014-2015 Creative Writing Reading Series and is free and open to the public. Each year, the Creative Writing Program sponsors the Creative Writing Reading Series, featuring four to six internationally renowned and prize-winning authors reading from their works and discussing writing with Emory students. For more information about this or any other Arts at Emory event, visit arts.emory.edu. This is event sponsored in part by the Hightower Fund.